The Africanized honey bee aka the killer bee has been a cause for concern for bee keepers across the USA since the 1990’s. Small swarms of Africanized bees are capable of destroying honey bee hives by invading the hive and killing the queen. 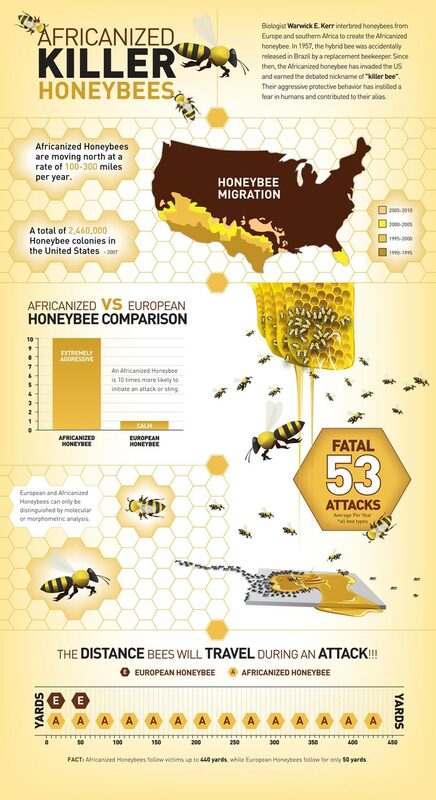 If you’ve ever wondered how far an Africanized honey bee will chase you or how many people in the US died last year from Africanized honey bee stings this brilliant inforgraphic by Pro Pacific Bee Removal has the answers.